Magic Mike “Magic Mike Cuts the Records” Magic Mike and the Royal Posse 1990 This song helped put Magic Mike on the yellow brick road for many, many years to come. Magic Mike “Drop the Bass” Magic Mike and the Royal Posse 1990 “Drop the Bass” disrupted the monotonous tone of the club scene, and the dance floor hasn’t been still since. Magic Mike “Feel the Bass” Magic Mike and the Royal Posse 1990 “Feel the Bass” established a pattern of utilizing car shows and the streets to break a record. Magic Mike & DJ Scratch’s Coca Cola Commercial Watching a DJ pair up with a Fortune 500 company like Coca-Cola to film a commercial was extremely innovative. Magic Mike “Vicious Bass” 1999 This single went gold at a time when complete hip-hop albums couldn’t. pioneer is someone who ventures into uncharted territory, leaving a mark for others to follow. So, if a DJ sold over 6 million units and became the first to earn one platinum and five gold certified plaques, would he qualify? How about if he was one of the first urban acts to be tapped by Madison Avenue to carry the marketing flag for Coca-Cola, Nike, Pioneer, and Microsoft’s X-Box? What if he had four albums on the Billboard charts at once, including two released on the same day? What if he had his own drive-time radio show at age 13 and a career spanning 25 years? 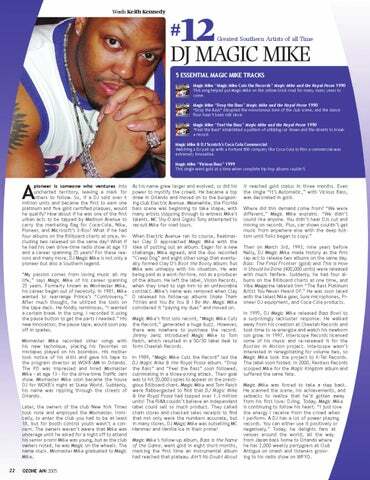 For these reasons and many more, DJ Magic Mike is not only a pioneer but also a Southern legend. “My passion comes from loving music all my life,” says Magic Mike of his career spanning 25 years. Formerly known as Mixmaster Mike, his career began out of necessity. In 1981, Mike wanted to rearrange Prince’s “Controversy.” After much thought, he utilized the tools on the tape deck. He fondly reminisces, “I wanted a certain break in the song. I recorded it using the pause button to get the parts I needed.” His new innovation, the pause tape, would soon pay off in spades. Mixmaster Mike recorded other songs with his new technique, placing his favorites on mixtapes played on his boombox. His mother took notice of his skills and gave his tape to the program director at WOKB-AM in Orlando. The PD was impressed and hired Mixmaster Mike - at age 13 - for the drive-time Traffic Jam show. Mixmaster Mike soon became the house DJ for WOKB’s night at Skate World. Suddenly, his name was rippling through the streets of Orlando. Later, the owners of the club New York Times took note and employed the Mixmaster. Ironically, to enter the club you had to be at least 18, but for booth control youth wasn’t a concern. The owners weren’t aware that Mike was underage until he asked for a night off to attend his senior prom! Mike was young, but as the club owners noted, he was Magic on the wheels. The name stuck. Mixmaster Mike graduated to Magic Mike. It reached gold status in three months. Even the single “It’s Automatic,” with Vicious Bass, was decorated in gold. Where did this demand come from? “We were different,” Magic Mike explains. “We didn’t sound like anyone. You didn’t hear DJs cut and mixing on records. Plus, car shows couldn’t get music from anywhere else with the deep bottom until folks began to copy.” Then on March 3rd, 1993, nine years before Nelly, DJ Magic Mike made history as the first rap act to release two albums on the same day. Bass: The Final Frontier (gold) and This is How it Should be Done (400,000 units) were released with much fanfare. 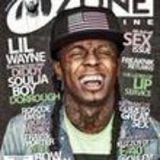 Suddenly, he had four albums on the Billboard charts at one time, and Vibe Magazine labeled him “The Best Platinum Artist You Never Heard Of.” He was soon laced with the latest Nike gear, Sure microphones, Pioneer DJ equipment, and Coca-Cola products. In 1995, DJ Magic Mike released Bass Bowl to a surprisingly lackluster response. He walked away from his creation at Cheetah Records and took time to re-energize and watch his newborn son grow. In 1997, Interscope Records licensed some of his music and re-released it for the Booties in Motion project. Interscope wasn’t interested in renegotiating for volume two, so Magic Mike took the project to K-Tel Records. The label soon folded. In 2000, Restless Records scooped Mike for the Magic Kingdom album and suffered the same fate. Magic Mike was forced to take a step back. He scanned the scene, his achievements, and setbacks to realize that he’d gotten away from his first love: DJing. Today, Magic Mike is continuing to follow his heart. “I just love the energy I receive from the crowd when I perform. A DJ has a lot of power playing records. You can either use it positively or negatively.” Today, he delights fans at venues around the world, all the way from Japan back home to Orlando where he has 2,000 weekly partygoers at Club Antigua on smash and listeners grooving to his radio show on WPYO.